This class is for those who want to complete their quilting projects themselves and want the convenience of using a longarm quilting machine. If you have a stack of quilt tops ready to be quilted or want to quilt each top yourself instead of sending it to a professional quilting, this class will get you started. 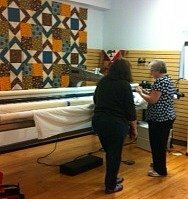 The class will cover the use of the APQS Millenium Quilting Machine and prepare you to rent the machine for your own projects. The class will teach you everything you need to know to be successful at finishing your quilts: How to prepare the quilt top and backing, choosing the best thread, how to safely use and care for the machine. All students will have the opportunity to try the machine and stitch a sample piece. In addition to this class, all machine renters will be required to purchase rental zippers. Rental zippers correspond with the zippers on the machine frame and will allow you great flexibility when renting. Zipper use will be discussed in class. Materials Included: Running Stitch provides class materials, nothing for students to bring except note taking supplies (camera can be helpful).